Get Free 4G LTE mobile wi-fi hotspots with discount unlimited service for $10/month! The Mobile Beacon donation program at Digital Wish provides free 4G LTE mobile broadband hotspots to eligible public and non-profit private schools throughout the United States. The Franklin r850 hotspot is the model currently being provided as a donation (A retail value of $70 each). Set up a hotspot in your gym, cafeteria or anywhere there's a wireless dead zone in your school. You can use these 4G LTE mobile hotspots to connect compatible computers or Wi-Fi-enabled smartphones and tablets to the Internet from any location within the 4G coverage area. The 4G LTE hotspot modems must be used with a subscription to Mobile Beacon's 4G LTE discount mobile broadband service for schools. Up to 11 hotspots available per school - Members can also choose to order 1 single hotspot or a block of 5 hotspot modems. Click here to order. If your school exceeds the 11 device limit, please contact us at [email protected] to apply for a quantity extension. Start a Hotspot Lending Pool- Many schools are ordering 5, 10 or more hotspots to start a lending program for students without internet at their homes. You can check them out just like library books and content filters can be added for security. Learn more HERE. Expanded coverge and faster speeds - Now Mobile Beacon's new COVERAGE AREAS have expanded across the USA by using the Sprint network and with LTE, your internet speeds are faster with greater in-building coverage. Access More. Teach More. Learn More. See real examples of how educators are using Mobile Beacon's wireless service to improve educational opportunities. Check for coverage: Mobile Beacon�s Internet service is provided on Sprint�s 4G LTE network. As Sprint continues to expand its 4G LTE network, you can check your COVERAGE AREA. 1. Enter your address and click �Map It!� as shown in Section A to the left. 2. Click and view the �Data� tab as shown in Section B to the left. Mobile Beacon does not offer phones (Voice). 3. You will see a pop-up that says, �Coverage depends on your device.� Important: In the Search Field type in "Franklin r910" and select the Franklin r910 Mobile Hotspot. You will then see whether this service is in your coverage area. 4. LTE coverage will be designated as �Enhanced LTE� or �4G LTE� (Section C). Sprint is constantly expanding their coverage areas. Find out what cities are currently covered. 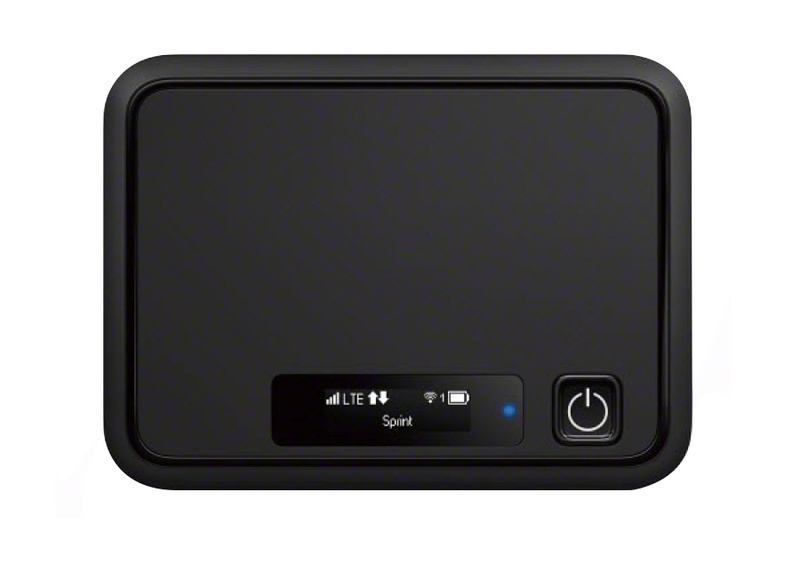 The Franklin r850 is a portable, wireless 4G LTE hotspot for connecting up to 10 Wi-Fi-enabled computers or electronic devices to Mobile Beacon's Internet service. It also has up to a 10 hour battery life. It's an ideal companion to stay connected during field trips, sporting events, and other off-campus activities. Review the Franklin r850 Hotspot Specification Sheet for details. 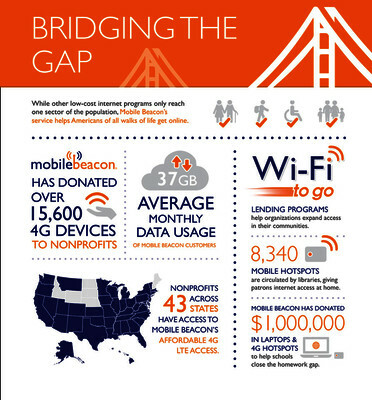 Organizations may apply for Mobile Beacon's donation once during the same fiscal year (July 1 - June 30) and receive up to 11 hotspots with subscriptions. If you need devices beyond what is included through Mobile Beacon's device donation programs, additional 4G LTE devices can be purchased from Mobile Beacon at standard rates. There is no limit to the number of devices you can request, and Mobile Beacon provides free consultation to help organizations determine the best devices for their needs. Visit our Hotspot Program Support Page - Get tips from other educators on the many educational uses for the hotspots and find out how your school can set up a Hotspot Lending Pool for Students here. Educators that participate in this offer must agree to pay Mobile Beacon in advance for one year of 4G LTE mobile broadband Internet service for each device received. The current education & nonprofit pricing for this service is $120 for 12 months ($10 per month, paid annually in advance). Digital Wish is not a party to this agreement. Refunds for the service must be requested directly from Mobile Beacon within 60 days of receiving it. See Mobile Beacon's limited refund policy here. The 4G LTE wireless broadband service offered by Mobile Beacon uses the Sprint network . Its download speeds average 6 to 8 megabits per second with peak speeds up to 25 megabits. Organizations must confirm that the location where they will use the Mobile Beacon service falls within the Mobile Beacon 4G LTE coverage area before requesting this offer. Verify coverage now. (See instructions in the Check for Coverage section above). The administrative fee for this product is not refundable, and the product cannot be returned unless defective. A $108 administrative fee will be applied at checkout. * You will need to activate the $120 annual 4G LTE plan with Mobile Beacon for the donated devices you'll receive. Digital Wish will email you subscription codes and instructions. A school, organization or personal credit card is required to process your subscription service with Mobile Beacon. The hotspot modems will be activated and shipped to your school address. You will renew Internet service directly through Mobile Beacon. If you find that you need more mobile hotspots after the first year, you can return to Digital Wish and request more Mobile Beacon products. Organization email addresses required - All accounts require that email addresses must be affilated with the school, not a personal email address. Case study: Recipient organizations must be willing and able to provide information to Mobile Beacon for the purposes of creating a case study or testimonial on this program. Product distribution: Products will be distributed under this program to qualifying schools and educators only. Recipient organizations may not transfer or resell Mobile Beacon products. 1.Who qualifies for this program? Educators employeed by Public and Private Non-Profit PreK-12 and higher education organizations qualify for this program. Other educationally based non-profit organizations may also qualify. Contact [email protected] for assistance. 2. I�m a teacher that does a lot of lesson plan creation and research at home. Can I use the device away from school? Absolutely! Mobile Beacon wants teachers to have anytime, anywhere access available. 3. Do we need to order the device through our school administration? No, - you can order service with personal credit cards, but you must be an employee of a school and you must use your official school email address to be eligible. 4.Some of our students don't have internet at home. Can we get the devices for their home use? YES! Digital Wish and Mobile Beacon believes internet equity for students is very important. A key benefit of this program is to help give all students equal access to the internet for their schoolwork. While families cannot directly order Mobile Beacon's service and get donated hotspots directly through this program, we have worked with school districts to set up Mobile Beacon programs to bridge the digital divide. Some districts appy for quantity extensions to get a lending pool of mobile hotspots for students to use for working on assignments at home. Other districts have set up service payment plans for families needing the devices for their children. Schools purchase the service and get reimbursed from families. Contact [email protected] to learn more and get assistance with setting up the best program for your district. 5. Is the service plan linked to the mobile device? Yes, the device is linked to the plan. This is a great bonus, because the hotspots can connect up to 10 Wi-Fi enabled devices. For example, if you're on a field trip with students, you can bring along three of the hotspots and have up to 30 students accessing the web at one time. 6. If ordering several devices, can I just order one service plan now to make sure it works for us? Yes, you can order one device now and activate the others at any time within the fiscal period (ending on June 30th). You can cancel your subscription within the first 60 days after activation if the service does not meet your needs. Please contact Mobile Beacon directly to cancel your service plan. You will be issued a refund for any unused months of service. -Important: Keep the original modem box packaging and all accessories. A return of the device cannot be processed unless it is complete in original packaging! 7. Do I need to order by June 30th? You can order at any time. We allow up to 11 devices per school per fiscal year which ends on June 30th. If you order your annual limit of 11 before June 30th, 2017, then you can get another 11 devices after July 1, 2017. If your school exceeds the limit and more teachers need devices or you want to set up a student Hotspot Lending Pool, you may apply for a quantity extension. Contact [email protected] to apply. 8, How many wireless phones, iPads, tablets, etc. can I connect to a Mobile Beacon device? Hotspots provide access for up to 10 wireless phones, tablets, etc. 9.Will the annual service cost increase after my first year? Mobile Beacon strives to keep the rate at $10/month and has done so over the past 5 years. Should it change in the future, our customers would be notified in advance. 10.What happens if my hotspot is broken, lost or stolen?If your hotspot fails because of a defect, it is covered by a one year manufacturer's warranty. If you break , lose it or it's stolen, you will need to purchase a new hotspot from Mobile Beacon directly at $120/unit plus shipping and handling. Your service plan would be transferred to the new device and the old one would be deactivated. Important: Record the MEID number on the back of the hotspot and keep it in a safe place. You will need this number when contacting Mobile Beacon about issues with the devices. 11. Are the devices CIPA compliant? Sprint provides a tool for content filtering on the devices. If you are interested in applying Sprint�s content filtering tool, please email [email protected] with the subject line �Content filtering for Mobile Beacon devices.� A customer service representative will reach out to you with more information about Sprint�s content filter tool. Additionally, we recommend schools who are loaning out devices to have students/parents be given cyber security/ cyber bullying materials from their district and also have them read / sign the district's Acceptable Use Policy. Mobile Beacon is on a mission is to make affordable 4G LTE mobile, high-speed Internet service available to schools and nonprofits, so they can use this technology to better carry out their missions. Mobile Beacon was created by a 501(c)3 nonprofit organization with over 20 years of experience serving the educational community. Today, the nonprofit is one of the largest national educational broadband service providers in the United States, operating in more than 50 markets. Through an agreement with Sprint, a leading provider of high-speed, wireless broadband services across the U.S., Mobile Beacon is able to provide high-speed data services and Internet access for all qualified organizations in the nonprofit and educational sectors. For more information, visit www.mobilebeacon.org. * The administrative fee helps to support our work in serving K-12 educators in the US. This helps cover our costs for credit card transaction charges, delivery of products to schools, customer support and verification services, staffing and overhead. Dimensions : 3.46" X 2.62" X 0.47"